Creating a culture that values people and raising up people to love them.” This mission statement of the St. John’s community is our foundational plumb line. Because God values people—we value people. The way we express value is by speaking courage into the lives of those entrusted to our care. 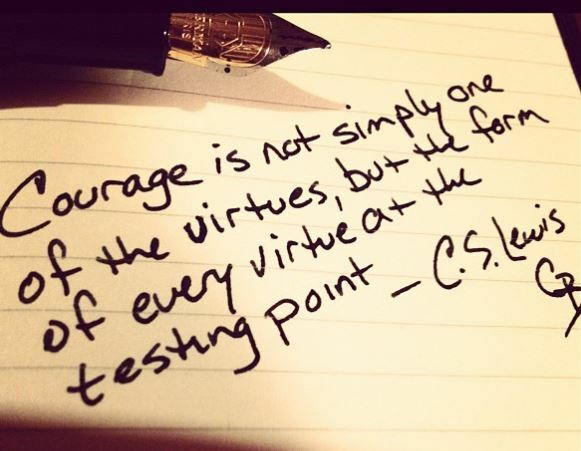 The word “courage” comes from the Latin word (“cor”) for heart. Courage is shown when someone is willing to be emotionally naked about their fears and their hopes. (http://www.etymonline.com/index.php?term=courage) This word has radically shifted from its original meaning. 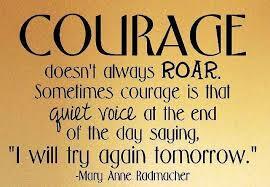 Courage today is viewed as someone who is strong or invulnerable. One who hides their fears is seen as strong over the one who is willing to be vulnerable and truthful. Followers of Jesus speak courage, exude courage and joyfully give courage away! Those anointed with the Holy Spirit are motivated to recast their focus from their imperfections to Jesus the perfect Savior. While there are countless benefits of building a church of encouragers, one of the most significant is that people are most creative and productive when they’re part of a vibrant courageous community. Life-giving faith communities are led by honestly courageous leaders who believe the more honest we are the more courageous we become. Are there people in your faith family you have a hard time trusting. I am exceptionally grateful to the community of St. John’s for granting me a Sabbatical. From mid-June through mid-September I will be teaching, writing and exploring. The first month will find both Bernardine and I in China. I have been asked to speak in Shanghai. The writing component will find me working on a book I am titling: “en-COURAGE-ment.” In addition, I will be returning to Canada for a 12 day canoe trip with BSA Troop 199. A Sabbatical is not a vacation, it is a change of pace and a time for active reflection. I am grateful to the St. John’s community that I love and that loves me! Jesus affirmed the importance of rest saying, “The Sabbath was made for man, not man for the Sabbath. So the Son of Man is Lord even of the Sabbath.” (Mark 2:27-28) The Biblical example of Jesus’ own frequent withdrawal to a quiet place to meditate, pray and be renewed is a model. In His ministry, the constant demands of people led Jesus to step away on a regular basis. See also: Genesis 1 and 2; Exodus 20:8-11, 23:10-12; Leviticus 25:1-7 (Sabbatical Year), 24:8-25 (Year of Jubilee); Psalm 23; and Ecclesiastes 3:1-8. Continual spiritual growth facilitated by periods of rest and renewal is vital toward being an effective minister. Pastoral responsibilities are not contained within normal office hours and regularly involve weekends. Rapid changes in parish ministry can increase the likelihood of burnout without periods of rest and renewal. Burnout makes ministry and the minister, dull, hollow, and uninteresting. Provides the opportunity for congregations to examine their dependency on the ministry leader and consider expanding the roles of lay leaders. A sabbatical for a parish pastor is a time for rekindling the sense of calling, for growing in one’s knowledge, and for deepening one’s spiritual life. It is a time for renewal and refreshment for those who serve others. It is also a time for a congregation to rediscovering its own resources for lay leadership within the congregation and to be itself renewed as a result of the sabbatical. The Rev. Bruce M. Hartung, Ph.D., Dean of Ministerial Formation and Associate Professor of Practical Theology, Concordia Seminary, Saint Louis shares, “There are natural rhythms in the order God created that, even in a fallen world, are health-giving and spirit-enhancing. Failure to appreciate and connect to these rhythms propels us toward disease and ill-health.” Acknowledging and coming into “sync” with these rhythms strengthens our resilience and creativity. There are many such rhythms. One of them is time off and away, of which Sabbath-keeping and sabbatical-taking are two manifestations. It is in the best interest of both parish and church worker to consider both of these. A Sabbatical is simply health-giving and spirit-enhancing. It promotes wellness and wholeness. A pastor has emotional highs and lows unlike most other vocations. In the course of a day, a pastor can deal with death, deep spiritual issues, great encouragement, petty criticisms, tragedies, illnesses, and celebrations of birth. The emotional roller coaster is draining. Your pastor needs a break—many times a break with no distractions. A pastor is on 24-hour call. Most pastors don’t have an “off” switch. They go to sleep with the knowledge they could be awakened by a phone call at anytime of the day. Vacations are rarely uninterrupted. It can be an exhausting vocation, and a sabbatical can be a welcome time to slow down. Pastors need time of uninterrupted study. It doesn’t usually happen in the study at church or home. There is always the crisis or need of the moment. Church members expect sermons that reflect much prayer and study. The pastor’s schedule often works against that ideal. The sabbatical can offer much needed, and uninterrupted, study time. Pastors who have sabbaticals have longer tenure at churches. Though my information is anecdotal, I do see the trend. And while I cannot prove a cause-and-effect relationship, I feel confident that pastors who have sabbaticals are much more likely to stay at a church because they are less likely to experience burnout. Pastors who have sabbaticals view the time off as an affirmation from their churches. I have heard from many pastors who share with me a sentence similar to this one: “I know my church loves me because they give me a sabbatical.” Pastors need affirmation. Sabbaticals can accomplish that goal.